Three for Thursday… On a Friday! Right here we go. Sorry I didn’t get chance to do this yesterday! 3. I fell in love with this when I saw it at work. 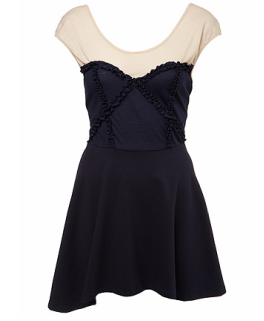 Its from Miss Selfridge and it is BEAUTIFUL! I love how it is two tone, and the skater style skirt is so floaty and cute. I want it so bad. I hinted at mummy last night, so this might end up under the Christmas tree, fingers crossed! 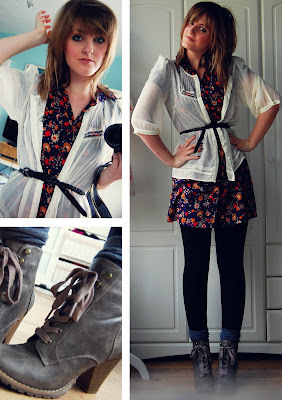 If you like it too, its £32.00 and you can find it HERE! 2. You know I like my shoes, and these beauties are no exception! These ‘Lordes’ heels are from Topshop, and cost £68.00. I love the cage style straps an velvety fabric! These are the kind of shoes that would last a lifetime. Perfect for nights out, perfect with tights, perfect for summer, perfect for EVERYTHING. The navy shade is bang on trend for winter and I can definitely say that I have a MASSIVE shoe crush on these babies. Buy me them? HERE! 1. Finally I’ve picked this STUNNING jewelry collection ( I couldn’t chose one piece so I cheated and showed three) by Zoe & Morgan for ASOS. 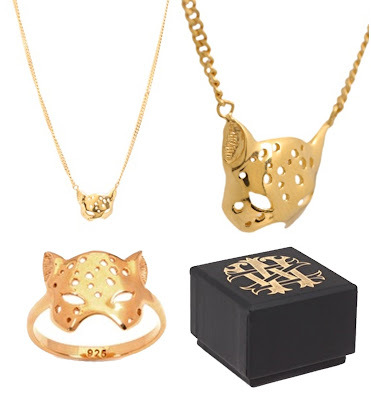 These beautiful pieces are from the ‘Tiga’ collection in the range, and I want all of them! Prices start at £59.00, and designs include tigers, foxes, lions and birds to name a few. I am contemplating saving up for the Tiga ring after Christmas! I hope it doesn’t sell out too quick! Find them HERE. So there is my Three for Thursday, on a Friday. Sorry again for the lateness! Aswell as this, I have won a coral striped tulip skirt for 99p, a sage green vintage style pleated dress for £1.04, and a blue tunic style dress for…wait for it… FIFTEEN PENCE! Thats right. 15p. BARGAIN. And to make things better, theses three were all brand new with tags! In other news… 😛 …. I ordered some (very expensive) film for my Polaroid camera I featured a few posts back. That should be arriving any day now. Excittingggg 🙂 I can’t wait to take some gorgeous pictures, and I can’t wait to show you the results! Off to relax now as I have a REALLY busy weekend ahead. Stocktake Sunday morning at 6.30am (boo), and my nephew’s 3rd birthday party on Sunday afternoon! I’m going to be one tired girly! "Shake It Like A Polaroid Picture!" Wow you're such an ebay pro, I never find stuff that cheap. Those boots look great! also congrats on winning the topshop vouchers! im mega jealous! Wow; okay, I adore that topshop dress!